The art of packing light can be a challenge even for seasoned solo travelers. With kids, it’s at least twice as hard! However, it’s worth the work – packing light with kids has always made our travels less stressful. When we went to Hawaii for ten days with 3mo Jacob, we each brought a HUGE suitcase and a carry-on bag. I remember the logistical struggle when we drove back to the airport with barely enough time, Ronnie still had to go return the car so he left me at the curb with all of the luggage and Jacob asleep in his carseat. Just to get to the outdoors agriculture station, I had to wheel one suitcase at a time while keeping an eye on my tiny baby. It was a stressful start to what was already a stressful travel day. A year later on the train from Seville to Madrid, we all woke up surprised to see that we were at our destination. Moreover, the train was imminently departing for the next leg of its journey! Ronnie grabbed his big travel backpack, a carry-on and Jacob (not yet walking). The train whistle actually blew as I jumped off the train with my bag on my back, the car seat in one hand, my carry-on in the other hand, and our trusty Baby Jogger City Mini dangling by its handle from my pinky. We managed to get our family and gear off the train in under a minute. Packing light with kids made the difference between continuing on as planned (with a hilarious story for the memory books!) or finding ourselves in a jam with half of our family and luggage potentially going to a different city and no means to communicate. 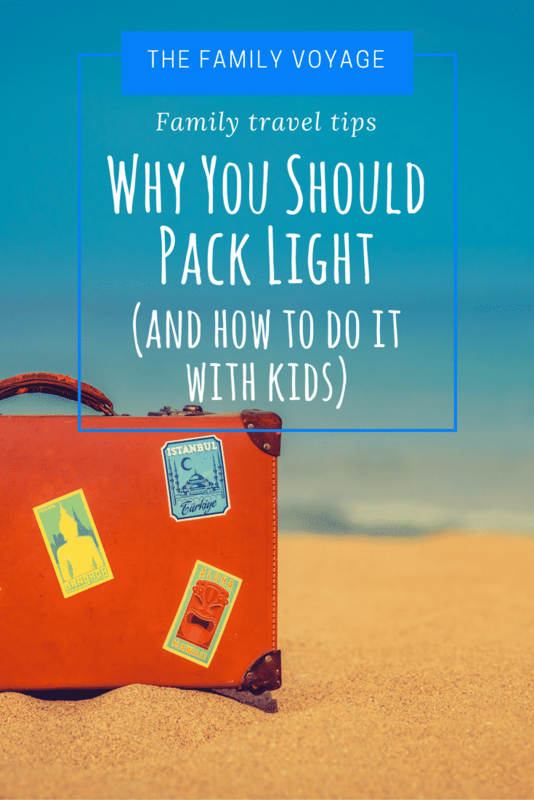 So without further ado, I present to you our top reasons why you should pack light with kids. No checked bags = No checked baggage or overweight fees. But less luggage also allows you to rent a smaller car, which can be a huge money saver in other countries. What does “carry on size” really mean? Looking for other ways to save money on travel? Check out our favorite resources. One of our first trips abroad was two weeks in France shortly after we got married. We didn’t anticipate laundry access, so we each brought two weeks’ worth of clothing. Ronnie got a good workout lugging those almost-overweight suitcases up flights of stairs at all our cute B&Bs. On later trips when we’ve each strapped on a well-fitting travel backpack with a supportive hip belt, it’s been no big deal. Everyone knows that kids like to run, kids like to wander, kids need you to hold their sweatshirts… Packing light will enable you to chase your kid through the airport if you need to or carry him when he’s tired. And if you’re really nice, you’ll use that free hand to carry a sweatshirt. Can your kids lose anything in any space? I thought so. The fewer items we pack, the less us grown-ups have to worry about. We unpack at each destination by putting each of our packing cubes in a dresser drawer. When we’re ready to move on, dirty clothing goes in the laundry bag and clean stuff is still in the packing cubes. We bring minimal toys, so those few go back in a carry-on or kid backpack. If the kids had 10 pairs of socks or an arsenal of toys, every move would take hours of prep. Do you love installing car seats? Me neither. When we stayed in Berlin, our apartment was a 15 minute walk from the train station. We could have called a cab, installed the car seats, strapped in the kids, loaded the stroller and luggage in the trunk, and then hopped in. For a five minute drive. Of course then we’d doing the whole process in reverse on the other end. Instead, we each strapped on a kid in front and a backpack in back, then loaded the car seats and our other bags on the stroller. It was a beautiful, stress-free walk to cap off our stay in the city. No frantic conversation with a driver. No sweating over seatbelts that don’t lock. We’ve had similar experiences in other cities too, and I’m sure there will be more. All loaded up for a weekend trip with baby. 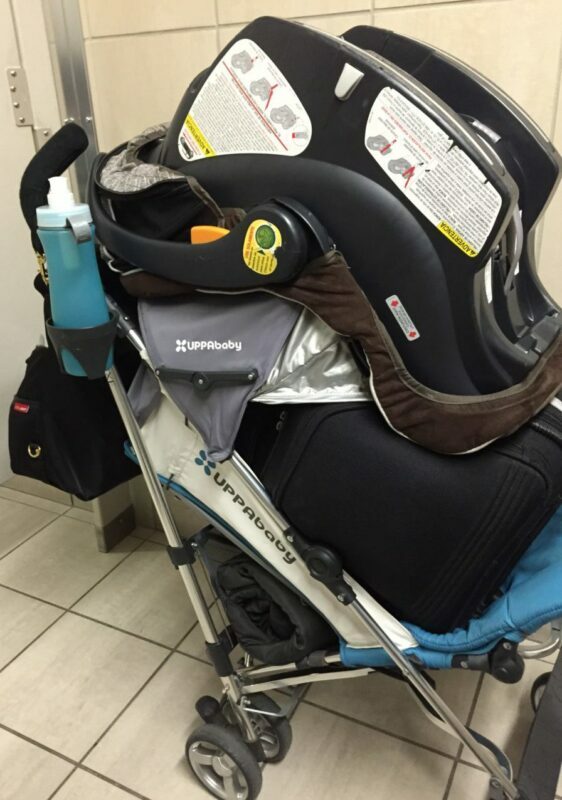 A stroller makes an excellent luggage trolley too. Jacob’s first travel experience was a (much too long) drive to Phoenix. We brought a pack n play, a bouncy seat, a play mat, a box of diapers and about 10 outfits for a five day visit with my uncle. We probably could have left most of that at home without noticing! Now that our kids are a little older and more opinionated, we try to set limits on what toys they bring. They can usually get by with a few small toys or games, basic art supplies, and one lovey or stuffed animal. Give serious thought to what you absolutely need versus what you can live without. We still make mistakes – read 8 of them that we made when we packed for our gap year! If you’re visiting a town where you know someone, try to borrow as much gear as you can! We’ve lent out travel cribs, car seats, strollers and high chairs to friends and friends-of-friends when they come to town. Likewise, we’ve borrowed from others when we travel. My mom lives on the other coast and when we come to town, she grabs some toys from a friend; when her friend’s grandkids come to town, Nana reciprocates. It takes a village, so don’t be afraid to ask. Another option is to rent baby gear as necessary – on that overpacked Hawaii trip I mentioned, we found a company that provided us with a bouncy seat and a playmat. They even dropped the items at our hotel’s bell desk before we arrived. Pro tip: If you’re staying at a hotel, they can usually provide a crib or pack n play. Did you know that many VRBO or Airbnb rentals can too? On Airbnb, click “More Filters” and expand the “Amenities” section to select “Family/kid friendly”. On VRBO, click “More Filters” and select “Kid Friendly”. Are everyone’s needs the same? Obviously the answer is “no”. Each member of the family has different needs and priorities that should be respected. For example, if we’re planning a vacation that incorporates one or two days of snorkeling, we absolutely bring Ronnie’s prescription snorkel mask (otherwise he might as well not snorkel). We might even bring masks for the kids since many dive shops or tour operators don’t have such tiny equipment (check out the best snorkel gear for kids of all ages). But for me? No thanks, I can rent it! Likewise, I may bring 3 pair of shoes on a trip (for both fashion and comfort), while the rest of the family only needs 2. The key here is to separately identify everyone’s needs, rather than assuming that a one-size-fits-all packing list will do the trick. Amazon Prime and other delivery services have revolutionized the art of packing light with kids. Last time we flew to visit Nana, the Amazon fairy delivered a booster seat, sippy cups, a few LEGO sets and everything else we needed. If you’re traveling domestically, don’t stress about squeezing in diapers, wipes, shampoo or anything else consumable – just order a few days in advance and send your package to wherever you plan to stay. This tip isn’t as applicable if you’ll be traveling abroad, though if you’re flying overseas to visit family you can always ask them to pick up essentials at their local store before you arrive. While you’re ordering, consider these eco-friendly travel accessories. Clothes definitely represent the lion’s share of our luggage volume when we travel with kids. We try to minimize by using a capsule wardrobe strategy and planning to do laundry during our trip. Where Ronnie and I might bring 4 days worth of clothing for a two week trip, we bring an extra outfit or two for the kids since they often need an extra change. When we stay at rentals through VRBO or Airbnb, we filter to find apartments that have laundry included. Save $40 on your first Airbnb reservation! Pro tip: Get each family member her own set of compression packing cubes in a different color. Stay organized and take a smaller suitcase! If you do need to bring certain things with you, try to find lightweight travel gear or items that do double-duty. Instead of a heavy pack n play, bring a Guava Family Lotus travel crib. Leave your full-size car seat at home, and grab a Cosco Scenara NEXT or a Combi Cocorro (our favorite travel car seat). Forget the BOB Revolution, take a Baby Jogger City Mini or an Uppababy G-Luxe. By the same token, we almost never travel with physical books now; instead, we load up an Amazon Fire tablet with free books checked out through our library or downloaded from Amazon Freetime.There are lots of great options for travel gear and if you plan to travel often or have more kids, the upfront investment can pay for itself in lower-stress travel. Pro tip: Already have a different tablet? Download the FREE Kindle Reading App to read books checked out from your public library! You can pack light with kids no matter how long your journey is and it has great advantages. The biggest hurdle for most of us is putting aside all the “stuff” and focusing on just the essentials! What kind of packer are you? Has parenthood changed your packing style? Add your best tips in the comments! Looking for other ideas on travel with kids? Really useful post! I struggle with packing light and always take more than I need. From the very few times that I have succeeded, I know that be short of something is better than experiencing too much physical strain. I hope to put some of your tips into action on my next trip! Thank you so much for this! I have struggled with packing light. For some reason, I bring items I don’t even use during my trips. Will share on my social media! I swear Amazon is like the Holy Grail for traveling haha I never even thought about it that way but its such a good idea. I know I don’t have kids but I do know that packing light is soooooo important. I remember traveling through Italy with a huge suitcase on Cobblestone streets and it was a NIGHTMARE. Never again, especially when you have to walk/run to your train or bus. I have gotten really better about packing lighter since my luggage has been lost and it’s such a hassle! Yes! I’m all about packing light! It’s so much easier and less to hassle with. Just takes a little planning! Packing cubes have saved my life as a backpacker and packing-light advocate! With kids, I’m sure they’ll be doubly important!! Great informative post! I supposedly know all the theory on packing light, but I’m still terrible at it, especially when there is a big baggage allowance and I end up thinking “oh I might need it, I’ll just throw it in…”! I need posts like this one to help me keep on track! I’m not a parent, but I definitely believe in packing light. I’m not sure I could handle the expense of ordering things I already own, but asking myself if I really need something is always a good question. And the more room I have in my bag, the more shopping I can do when I travel! Girl, you are a rockstar for making light-travel happen with kids. I try and fail miserably even when I’m traveling solo in the summer haha. I usually end up over-using one or two many items and ignoring the rest of my over-packed contents and I guess it boils down to my FOMO. I’m going to religiously follow your guide the next time I travel to make this happen. Thanks for the excellent guide. Packing light has ALWAYS been a challenge for me! I can be going away for the weekend and will take my 28″ luggage and won’t use half of what I packed. Can you blame a girl for wanting options? Lol. I don’t have kids but I do need to start packing lighter. I packed just a carry-on for Mexico and I was so excited!!! To help me conserve space, I’ve started using packing cubes, and they’ve been keeping me in check!! I can only imagine how it’s like to travel with kids and I think that the essential part of it all is being very organized and good at packing. You have some very good and useful information posted here, that would be applicable not only to people who are traveling with kids, but to all of us having trouble with keeping luggage in the norm. Packing light sort of comes naturally to me. I’m super low maintenance so only need a few changes of clothes and very few toiletries. I am a bit of a worrier though, so will always have pointless items “just in case” (think foil blankets, medication for every type of ache and pain, at least 5 sharpies and a spare birthday card), but these don’t take up that much room so I’ll let them be. With all that being said, packing light for one is a struggle at times. I cannot imagine how it must be when you add children into the mix!! I don’t have any myself but my brother and his partner can easily fill both their cars with cases for a short weekend break for them and their 3 kids. And apparently it’s all “essential” items! I’ll have to send them your article before their next trip! We’ve been away with the kids so many times and I am still completely rubbish at packing light. I really really need to get better at it!